Hi, glad you’re here, my 7-year-old can’t read either. In fact, go back a couple of years and my first 7-year-old couldn’t read. It seems to be an epidemic, this non-reading 7-year-old thing, and it seems to worry mums of 6 year olds and 8 year olds too. I’m here to make you feel better and maybe help you help your child to learn to read. Why Can’t These Children Read? Child 1 was in school and couldn’t read in year 2. So bad was his literacy that he wasn’t doing any maths through total inability to read the questions. Child 2 has been unschooled, he’s never been to school and never been made to read. He showed great promise, it looked as if he was going to teach himself to read as he picked things up so quickly at home from charts, cards and online fun. Then he just stopped. He lost interest for much over a year and totally didn’t want to go there. Child 2 loves to read now, Child 1 is well on his way. So What To Do to Help Them Learn to Read? Well, do we really need to “do” anything? 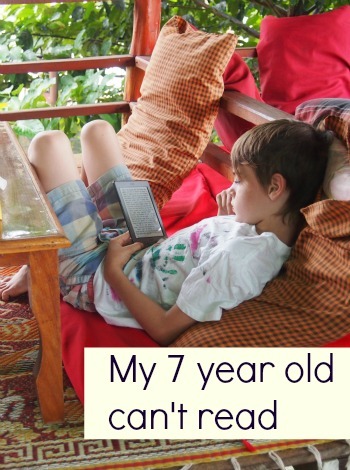 7 is still very young and in a perfect world we shouldn’t expect 7-year-olds to read. Unfortunately the school system in most countries says they should. It really isn’t going to make much difference if they learn at 5, 6, 7 or 10, but, if you’re here you’re clearly concerned. Children all learn at their own pace and maybe neither child was ready to make that next step. Or were they? Was there an issue with the way they were being helped with their reading ? We can offer you a free trial of Reading Eggs, it’s a 100% online reading and English programme. It helps children with literacy right from the beginning, to age 13. Both of my boys had access to this programme, enjoyed it as a game, and it helped them progress to the point of being superb readers today. It’s available in UK, US and Australian versions and accents. Click below to sign up for your free trial. I pulled child 1 out of school as soon as I found out he was being left behind. I had the homeschooling application in the post that weekend and he hasn’t been inside a classroom since. We ditched the graded readers in favour of Roald Dahl, we snuggled together in bed, I read a word, he read a word, then I read a line, he read a line, then I read a paragraph, he read a paragraph. It took one book ( it was The Very Hungry Crocodile), all of it read in my big soft bed, and he was away. He polished off half a dozen Roald Dahls before he hit the Harry Potters. He adores books now, can’t get enough of them, they are a joy to him and his reading is a joy to me. Child 2 was never going to roll that way. He really doesn’t want to read, but he does like to write and he’s driven by competition, excelling and an urge to make money. Watch out Richard Branson, Boo is on your heels! Carol Vorderman is our best friend, we love her books for English, Maths and Science. My solution with this tough nut was to get him reading, and not let him realise he was actually doing so. No readers, no way, but written work books seemed to float his boat.Simple English books( click to see our favourite series of books ever) where he just had to fill in missing letters or circle a particular word helped a lot. READ NEXT BLOG What is the Purpose of School? Huge improvements came within weeks and he was more than happy to have a go, so long as he got everything right. He enjoys word searches and simple crosswords, he does those for fun, but a big breakthrough with Child 2 was blogging. I set him up with his own blog some time last year when he showed an interest in sharing his photos with the world. A couple of weeks ago he got heavily back into the blog and has been churning out a post every day. At first I typed his words for him, within days he was typing them himself. Sure, he asks me how to spell all but the simplest words, but that’s great, he’s learning. He’s so impressed with seeing his own viewing figures grow and the distant prospect of making some money that it’s hard to get him off the computer. He loves receiving comments and reads them himself, with a little help. He always reads back his posts to me before he hits publish, just to check everything is OK. He’s doing incredible things but he STILL thinks he can’t read. Whatever, I’m happy with that, he’ll wake up one day to his own ability, I’m sure. Of course you could leave them in school, pay for tutors, get medical assessments, check for dyslexia and all that stuff. We didn’t. If you choose that route because it’s best for your child then more power to you. It’s all about what’s best for the individual child at the end of the day. Don’t force it. Watch and wait, find out what floats their boat. You could, of course, take the radical unschooling route and leave them to read when they’re ready, that’s cool, but not for me. I think their lives would be enriched by reading, so I want to get it nailed. Don’t turn them off the written word with those horrible readers. They work for some, but not for all. Don’t push, criticise or shame them into reading. Give them choices, make it fun and take the pressure off. Find any sort of puzzle or game that involves words. Child 2 loves Monopoly but we soon realised that he wasn’t actually reading the words, he’d memorised the cards. He has, what I think will turn out to be, a photographic memory. Knowledgeable people have written knowledgeable posts about this subject. I’m just sharing my experiences and my advice, from one mum to another. Why? Because a few years ago I sat at the computer, late at night, tearful and stressed and Googled “My 7-year-old can’t read.” Good luck. His love of animals, cats in particular, lead him to this book series, he was gripped from page 1. Update: The non reading 7 year old in this post is now a book obsessed 9 year old. He started reading for pleasure when he was 8. The trick was, to find books he loved. 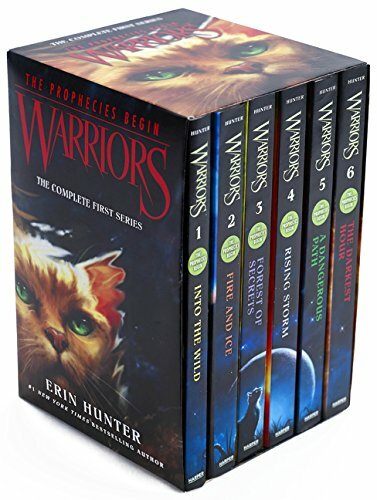 He’s always adored animals, so the first series of books he consumed was the excellent Warrior Cats series. From here he moved on toPercy Jacksons to become expert in Greek, Roman and Egyptian Mythology and right now he’s on the last of the Harry Potter series. It all turned out fine in the end. Hi Alyson, I too googled my 7 year old can’t read, only a few days ago-I sometimes panic and sometimes I’m fine with it. My eldest daughter was almost put off reading at school with those monotonous books! We are unschooling at the minute but I’m not sure I am totally ok with it; she amazed me the other day knowing a lot of her letters (she refuses to do flashcards etc), and she loves to vlog even though she just does it for her own entertainment. She’s a highly sensitive child (I’ve not had her tested) and if she had been in school I’m sure she would have been put into remedial classes/been labelled, and would have been disruptive. As it is she, is very loving and bright, and has a brilliant sense of humour. I’ll be interested to follow along with you! P.S. That video the boys did was priceless. Yes, I too, had that ‘7 yr old’ thing going on in my mind. Just as I started to look up extensive ‘teach your child to read’ programs online, my son, indirectly, stopped me in my tracks … on the night before his 7th birthday he decided that he wanted to read the ‘bedtime’ story to myself and his sister. I was a little surprised and even a touch nervous, knowing that he hadn’t been exposed, or developed any ‘formal’ pre-reading skills. I just didn’t want his precious confidence to be crushed when he was coming at it with such excitement and enthusiasm. Well, he absolutely blew all of that fear out of the water! He proceeded to read a Dr Suess classic from cover to cover (with a little help here and there) and the 3 of us all burst with pride. It was absolute gold! Since that night he has stormed ahead and he loves his reading. That experience taught me a good homeschooling lesson – relax, believe in yourself, and be ready to be delighted! And most important, time is on our side – no rush, no pressure. That’s awesome Robbie and exactly what I expected Boo to do, but he’s almost 8 now and wasn’t showing any signs of being there. Enough was enough, mum had to get pro active. It’s really only taken a month, he’s there now. I can slip back into unschooling happily again for a while. Robbie, by the way, that’s exactly where Boo was about a year ago, he was nailing Dr Seuss, he’d actually memorised them, I’ve realised. Zero progress since then, I think his incredible memory ( it’s really amazing, he can tell you which letters surround every key on the keyboard, this was before he started blogging) has actually stopped him progressing in some ways. I need to Google, see if it’s a “thing”. Hi Melanie, Yes, I was perfectly OK with the 7 yr old thing, but he’s an almost 8 yr old and he’s missing out on so much. Not just books, but using the computer properly or reading the Doctor Who pages he’s always Googling. I decided it was time to take action about a month ago and it’s coming together really quickly now. I was pretty keen on the idea of unschooling him, almost to prove a point, but enough was enough for us. We spend so much time on buses, planes and generally in limbo, we 3 read, he can’t, so he’s bored and disrupts his brother. The thing I’m most concerned about Alyson is that she may be developmentally behind and I’m just letting her coast along! I don’t think she is, but there’s always that little niggle isn’t there? I know, but if she is, then that’s just who she is. Pushing her won’t change that, just stress everyone out. Child 1 has plenty of issues, but for him, he’s doing just great, he’s half way through an awesome blog post about the Mayans, sometimes he surprises me. Mothers are born to worry and worry is a natural inbuilt defence mechanism, so they tell me. It helped cave men plan what to do if a saber toothed tiger attacked, worry about tigers instead. Or do the doctor thing, but I won’t go there. So true-deep down I know she will be just great; it’s just those darn education authority visits. Our EA is quite good, but the last visit we had they said,”That’s all well and good that you don’t want to push her to read, but she needs to be able to read to function in society!” I won’t tell you what went through my mind, but it involved a lot of expletives! I love this post. Your creative ideas, your confidence, your belief in each of your kids. We always have this nagging wonder whether to back off or push harder. Your voice has helped many parents, teachers, and children. Thank you so much. Thanks Cindy. We’re many years down the line now, they’re teenagers and the 2 boys above are enthusiastic, voracious readers. No worries at all. One last tip, even though I unschool my own two children now, including my 7 year old son, there are still some of my teacher traits hanging about, and I do think that learning their “sight words” through games and cards, really helped my kids pick up reading. Their confidence grew so quickly when they realised that they recognised most of the words on the page. Such a shame we had those graded readers as ” homework” each night from school. It was so, so painful and ruined what little precious time we had with our children in the evenings. My 8 year old has struggled with reading from the start. Thankfully her teachers and school have a slow approach to reading and writing so instead of panicking, they put in place some support mechanisms that went back over the skills she needed but without being singled out as a struggler. At 8, she is now starting to take off but most importantly, her comprehension is there when reading. She was awwwing at a book she was reading on her kindle and I asked her what had happened. “So many poor panda babies die. 50% of them.” Being a teacher myself, I couldn’t help but chuck in some maths and asked,”So if 10 pandas have babies, how many survive?” The exciting bit was she answered correctly! Yay! So while she’s still a fair way behind peers, I’m not worried because she’s got years to become proficient at it. She’s doing well where she’s at and that is brilliant in my eyes. My 2nd child is reading like a pro now too Stephanie, when he was ready, off he went. I should post about how it all came about, it was really interesting. I was worried about my kids too who are now 10 and 13. The 13 year old boy started reading for pleasure around 8.5years and now often has his nose in a book. 10year old girl was around the same age but read younger than her age books (content was more interesting for her). We continue to read out loud as a family and take turns. We have just finished the 7th Harry Potter book (over 3 years for the whole series). Bith my kids have been identified as “gifted” – 6 years ahead for 1, 3.5 for the other and yet they were both late readers. Comprehension is good now too I think from reading aloud. Yep, mine have just picked it all up naturally Elaine. Comprehension is remarkable in my elder one, better than mine often. We were nevr big on reading aloud, I read some classics that were too hard for them to read themselves, the old stuff, The Hobbit, Treasure Island, Tarka the Otter. The language style was dull for them, they would never have read them for pleasure themselves. Well, maybe The Hobbit later, they were 7 and 9 then. The Harry Potters are perenial favourites here, fabulous books that I’ve never read! I HAVE A 6 1/2 YEAR OLD IM HOME EDUCATING HE JUST CANT PICK UP THE SITE WORDS THEY JUST DONT STICK ,YES IM WORRIED… BUT WHEN I LOOK AT HOW HE IS HE CAN BUILD ANYTHINK. HE DIDNT START TO TALK PROPERLY TILL 4 YEARS OLD AND MY 4 YEAR OLD ONLY STARTED TO TALK IN JANUARY,PARENTS ARE VERY QUICK TO JUDGE,LAST YEAR I LOST A BABY AND FOUND OUT THAT A CHROMAZONE 17 WAS RETARTED IN MY BODY THIS AMAZED ME AS MY 24 AND 25 YEAR OLD GIRLS 1 WAS FAST AT LEARNING AND 1 BATTLED HER WHOLE SCHOOL LIFE,BUT NOW BOTH LOVE READING,NOW FINDING OUT ABOUT THE CHROMAZONE 17 I FOUND OUT IT CAN MAKE IT DIFFICULT TO LEARN THINGS LIKE READING AND MATHS WHILE THEY ARE YOUNG.WHEN I LOOKED BACK AT MY CHILD HOOD MY 6 BROTHERS AND 4 SISTERS AND I ALSO HAD TROUBLE LEARNING TO READ,BUT IN OUR TEENS WE ALL NEVER WAS WITHOUT A BOOK, THE SPECIALISTS SAID MOST LIKELY OUR WHOLE FAMILY HAS THIS GENE RETARDED AS IT PAST ALONG BY PARENTS, AND THEY SAID IT AMAZING HOW MANY PPL HAVE A GENE NOT PERFECT BUT WILL NEVER KNOW UNLESS IT SPECIFICALLY IS LOOKED AT AND THIS ONLY HAPPENS IF YOU LOOSE A BABY AND HAVE THE GENES CLOSELY LOOKED AT. Thank you so much for this post! I needed to hear it all. I have 7 year old twin girls. One taught herself to read, and I have no idea what level she is, since we unschool, but she can pretty much read and spell anything. She LOVES to read. Her sister is a different story. She can barely read anything. She just learned her letters and sounds. She is good at pretty much everything, except reading. She does want to read though. Thank you for recommending the Carol Voderman books! These look amazing! I had never heard of them before.